I picked up this book because it was compared to Geek Love and The Night Circus, two books that I LOVE. There’s something about a weird carnival/circus setting that I find irresistible. Usually circus books have an element of the dark and bizarre combined with surprisingly touching sentimentality that makes for a delightful juxtaposition with interesting twists and turns. And the characters! What’s not to love about a kid with flippers for hands or a bearded lady or a sword slinger or a creepy magician? A great, vividly realized setting: most of the book is set in the underbelly of Manhattan at the turn of the century (the 20th century, that is). An opium den, an insane asylum, and a brothel all feature prominently. Unique and weird characters: twins with mysterious crescent-shaped scars behind their ears, a little boy who lives in underground tunnels and wears a newspaper mask to cover the hole left behind after his mother cut off his nose, and more (see below)! Interesting twists and turns (some dark, some sentimental): without giving anything away, I will simply say that I was surprised while reading on more than one occasion. First, there’s Sylvan, an ugly, bearded orphan known in the streets as Dogboy. Sylvan is a night-soiler (a man with the unfortunate job of cleaning out privies behind tenement houses), who often finds random things (brooches, coins, and such) dropped or discarded in the privies. But on one fateful night what he finds is not a treasure or a jewel . . . it’s a baby, nearly dead. Despite his foreman’s instructions to leave the baby where he found her, Sylvan decides to rescue this abandoned girl. Next, there’s Odile Church. She’s the daughter of Friendship WIllingbird Church and the twin sister of the talented Belle Church. Years ago, Friendship created the Church of Marvels. Its performers included Georgette, “who had four legs . . . She ran on her outer legs, while the inner ones dangled between, shrunken and spindly,” Aldovar, half-man and half-woman, wore “a wedding gown stitched to a tuxedo . . . rouge on one side, a penciled moustache on the other,” and the beautiful Belle, a contortionist and sword swallower. Odile, who was forced to wear a back brace, was stuck on the sidelines. And now, Odile is all alone. 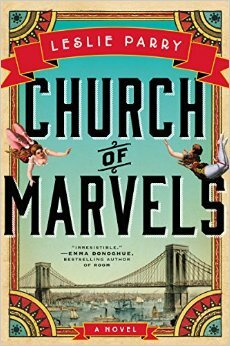 The Church of Marvels burned to the ground with her mother inside and, soon thereafter, Belle, stricken with grief, absconded to Manhattan. What was left of the circus was sold to a man named Guilfoyle, who prefers slight-of-hand to actual talent. Odile decides to venture to Manhattan in search of her sister. Her second morning on the island, Alphie was woken early for exercise. Promenading, the nurses called it-as if she were a debutante out for a stroll in the park. In the parched light of dawn, she and the other women, pilloried and aching with sleeplessness, were marched down the path to the river. Leather collars had been fastened around their necks; a long cable yoked them together like mules. Her blue flannel dress, with its course, unfamiliar stitching, was stiff with mildew and smelled like turpentine. Her head throbbed; her ears crackled and hummed as if they were full of water. She stared again at her hands. There was a pale, puckering groove around her finger where her wedding band used to be. Where is Alphie? She’s at a loony bin, of course. Deposited there by her crazy, evil mother-in-law. Alphie is sure her husband has no idea where she is . . . and it’s just a matter of time before he finds out and comes to rescue her. The book is separated into three parts (each approximately 100 pages long). The first part (where we’re introduced to the three main characters) and the third part (where everything comes together) are really excellent, but the second part (where things kind of develop and meander) is kind of boring and a little too complicated. Despite those middle 100 pages, I enjoyed this book immensely. I loved the setting, which is dark and fascinating and fun and different. The characters (especially Alphie, Belle, and Odile) were unique and damaged. The story is intricate and interesting and surprising. Like a good circus book, this is a weird and captivating book. Who should read it: This is a book for fans of historical fiction set in captivating and vividly rendered settings with weird and oddly likeable characters. Shana Hookehande, I’m looking at you. This entry was posted in Rating: 4/5 and tagged Book review, Book Reviews, Books, Church of Marvels, Leslie Parry. Bookmark the permalink. You had me at “Night Circus” — I’m on it. I don’t think the comparisons to The Night Circus were particularly apt, unfortunately. Nevertheless, it’s a good book. I think you’ll like it.